Lewes Bonfire Council, Lewes District Council, Southern Trains and Sussex Police, together with the other emergency services and St John Ambulance are members of the Lewes Bonfire Safety Group who work throughout the year to minimise risk and to ensure the safety of the public. The advice from the Safety Group is not to attend - PLEASE LEAVE IT FOR THE PEOPLE OF LEWES. It is particularly unsuitable for the elderly, young children and those with disabilities due to the density of the crowds. Further information is available from The Lewes Bonfire Council, for general enquiries please contact: Keith Austin on 01273 471516. Please Note: Entry to some of the fire sites requires a pre-paid ticket. The Lewes Bonfire Safety Group produce a leaflet entitled "Lewes Bonfire Celebration. Celebrate Safely". It is available at the Tourist Information Center and various outlets around Lewes. It is partially reproduced here with their kind permission. Lewes Town is closed to motor vehicles from 17:00 on the 5th November (Saturday 4th if the 5th falls on a Sunday) until 01:30 the following morning. On-street parking is restricted on many roads. If you are parked within the area of the road closure after 17:00 you may find you are unable to get your vehicle out before the end of the event. Check the map for some parking locations, but choose carefully. Travel with others wherever possible because spaces are limited. Any vehicle obstructing the processional routes will be towed away and a recovery fee payable. Most of all drive carefully, especially around pedestrians (it may be better to park safely out of town and walk in). Possibly, half the visitors come in by train and the rail company provide special services to cope with demand, but try to avoid peak times and expect crowding. For safety reasons returning passengers will find a queuing system in operation outside Lewes Railway Station. You will only be able to join the queue from the Lansdown Place end of Station Road. Check the signs carefully and ensure you get in the right queue. Staff will be on hand to assist. Long queues can be expected especially for Brighton trains. Last services depart between 00:00 and 00:30 depending on your destination. Don't leave it too late to join the queues or you may miss your train. Don't panic, keep calm and follow Police directions. Safety Zones are available to assist with safe evacuation. If your clothing catches fire STOP, do not run, DROP to the floor and ROLL over until the flames are out. Cool burns by pouring water or other cold liquids over them, seek assistance immediately. St John Ambulance and Sussex Ambulance staff are on duty on foot and also at the First Aid Points (see map). Lewes bonfire celebrations are unique involving 31 different torchlight processions and 5 firework displays. While providing great spectacle, it can also be very confusing for spectators as bonfire societies process around the town at the same time. Do not be tempted to follow a procession in the road as doing so causes un-necessary congestion and can delay other processions. Some roads in the town center are closed to the public to create Safety Zones for emergencies, others are one way only for pedestrians (see map). Between 19:00 and 21:30 the High Street between the War Memorial and Watergate Lane becomes very congested, and movement very restricted. There is a HIGH RISK of injury from crowd pressure; avoid the area if it is already busy when you arrive. It will get very noisy and the air will be thick with smoke from the burning torches. It can become very uncomfortable for some people, especially the very young, the elderly and those with disabilities (this includes those effected by strobe lights and flashing light displays). Processions start at about 17:30. The united Grand Procession starts at about 20:00. Afterwards, the Lewes Societies march to their own fire sites at about 21:00. Full details of the routes can be found in the Bonfire Societies' programs. 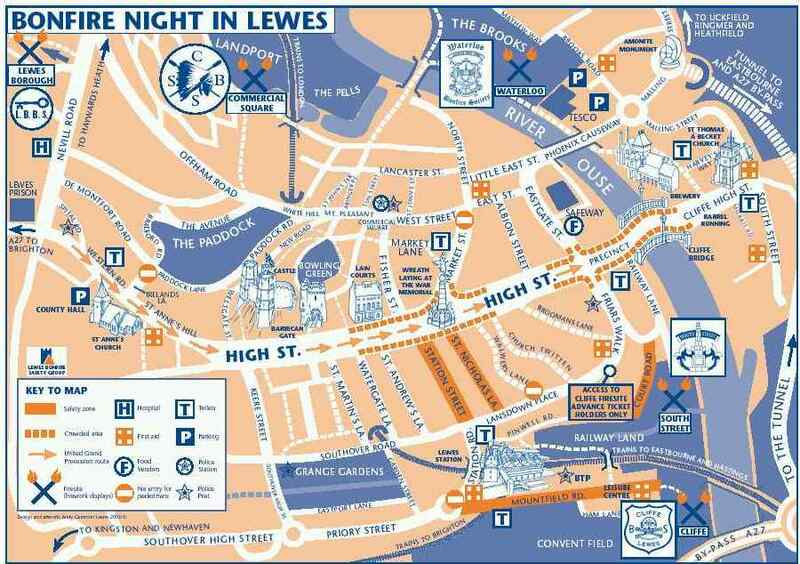 Map design and artwork: Andy Gammon Lewes 2000 (c), reproduced here with the kind permission of the Lewes Bonfire Safety Group.